When space or function becomes an issue, more homeowners have been opting for Arizona home additions rather than moving to a new property. Home remodeling can be a huge undertaking. But most projects, when done professionally, will pay for themselves over time. Arizona home additions are no exception and provide tons of homeowner benefits. Not only will you boost your home’s value, but you’ll extend the overall square footage and add functional living space. And if you select your building materials and finishes carefully, you can enhance your home’s character. Your room addition, whether it’s a single room, second-story or outdoor add-on, will be a major success if you plan your project carefully before work begins. Although properly constructed Arizona home additions will provide significant returns on investments, homeowners must proceed carefully. First, you need to hire a professional remodeling contractor with a proven track record in room additions. Then, you must do some serious homework so you know what you’re getting into. Homeowners considering Arizona home additions must evaluate several factors to avoid a project going south. Issues in two specific areas can make or break your room addition: Zoning and Existing Home Systems. Nothing could be more frustrating than planning a beautiful room addition only to find out it violates your community, city and county zoning laws. So, before you even begin to design an addition, know what you can and can’t do on your property. Check your legal documents, such as property deed, CC&Rs (Covenants, Conditions and Restrictions), bylaws, and more. Setbacks – How far does your building need to be away from the front, back and side lot lines? This buffer area requires open space between neighbor structures for fire safety and appearance. Structure Height – How high will your addition reach? Limitations exist so fire truck ladders can reach upper floors, neighborhoods maintain a uniform appearance, and neighbor views and/or access to sunlight aren’t blocked. Buildable Area Ratio – What’s the total amount of built space versus open space within your property? This ratio varies by area, but communities restrict the amount of yard homeowners can use for building. Local Rules – What special restrictions does your community have? You may have limitations because of historical conditions, CC&Rs or something else. 2. Existing Home Systems Up-to-Snuff? A second major problem area for Arizona home additions is within the existing home’s systems. As much as possible, you need to examine your home to see if these systems can handle the demands of your new room addition. However, issues may not be uncovered until remodeling work begins. That’s when you really need to count on your experienced remodeling contractor. 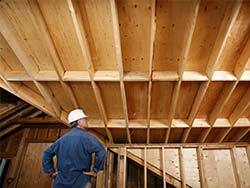 Structural – Will your foundation be able to support the room addition? A second story addition will put extra stress on a foundation and may require a new support system. A second story will also affect the first floor ceiling structure. Electrical – Will your existing wiring support the room addition? Arizona home additions almost always will require new circuits to boost capacity. You may even need to upgrade your lighting, appliances and other electrical equipment throughout your home. Mechanical – Will your existing heating and air conditioning system handle the new space? You may need to add a system or upgrade your existing HVAC system. Hazardous Materials – If you own an older home, does it likely have any hazardous material that requires special handling? Examples include asbestos and lead paint. Removal of these materials can be quite involved and pricey. Knowing ahead of time what existing systems may be affected can help you plan a realistic budget and avoid any surprises once construction begins on Arizona home additions. You may even need to bring any outdated systems up to code. If you’re thinking of adding a room to your home, proceed with as much information as possible before construction begins. Work with a well qualified remodeling contractor that has ample experience in Arizona home additions. Armed with knowledge and a great contracting partner at your side, you’ll be as prepared as possible to overcome any obstacles and then enjoy the many benefits of your amazing room addition!